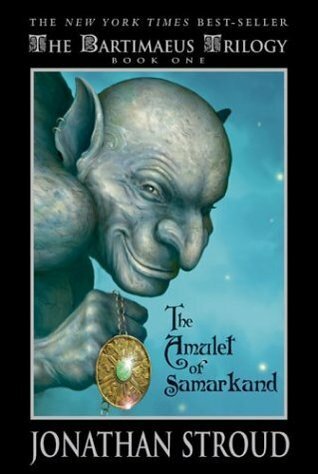 Bibliographic information: The Amulet of Samarkand (Bartimaeus #1). Jonathan Stroud. Miramax, 2003. $17.95. 462p. ISBN-13: 9780786818594. Summary: After incurring the wrath of Simon Lovelace, a powerful magician, ten-year old Nathanial, a magician’s apprentice, decides to summon a 5,000 year old djinni named Bartimaeus to steal the Amulet of Samarkand from Lovelace. Bartimaeus could care less what his assignment is, he just wants to get back to the spirit world and be left in peace. The djinni’s sole goal is to get the amulet and then get back at Nathanial for summoning him. Bartimaeus preferred his earlier master, Ptolemy, to Nathanial and takes every opportunity to say so. Although, since this is a rather difficult assignment, Bartimaeus and Nathanial get caught up in a flood of magic, rebellion, and murder that the two have to work together to survive. Review: Filled with interesting characters and a plethora of magic, this book will catch your attention and pull you in for a tantalizing ride. The tale is narrated by Bartimaues, a 5,000 year old djinni, who takes sarcastic to a new level. His hilarious script paired with the dark and foreboding tale makes for an intriguing story that is sure to lure you in and you won’t want to wait for the sequels. Stroud’s elaborate descriptions and great details make the images of the story pop into your head. While narrating the story Bartimaeus will make side comments that are numbered and can be found at the bottom of the pages in Chicago style writing. Tweens will get a kick out of the crazy tricks that Bartimaeus and Nathanial pull off together. Readers’ annotation: Nathanial feels confident enough in his magical powers to summon up a 5,000-year-old djinn, but he is in for a rude awakening. Bibliotherapeutic usefulness: The various supernatural monsters in this book would help children fight their fears. Many teens have monsters in their lives that they are afraid of and reading about some will help them cope and get past these fears whether they be make-believe or real. Issues present: There is magic and supernatural monsters present in this novel that people may object to. It may go against their beliefs and they will not want their children reading such things, however, children use such books to fight their fears against monsters make-believe and real. Also, different viewpoints on religion gives children a broader scope of the world. What happens when you summon a 5,000 year old djinni who thinks he’s a know it all? Why I chose it: I found this book a the list of challenged books while I was working on one of my projects for class and thought I would read it and add it to my collection.